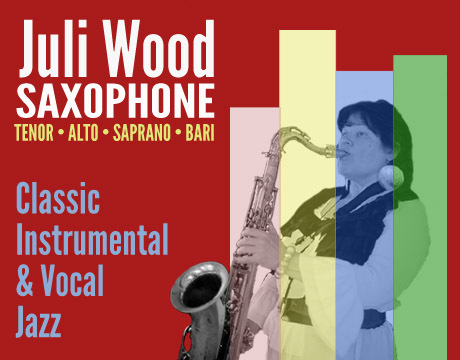 Whether it is for a wedding, a party, your corporate event, clubs or festivals, Juli Wood provides some of the best hip, rip roaring live jazz in the city of Chicago. 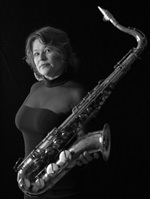 Juli not only plays the saxophone, but she is an accomplished singer as well. If you are just looking for instrumentals or vocals, Juli is able to work with any budget providing entertainment from solos to quintets. Juli plays tried and true jazz standards from the Great American Songbook such as; George Gershwin’s I Got Rhythm, Summertime, Someone To Watch over Me, Our Love is Here to Stay, But Not For Me, Embraceable You, A Foggy Day; Cole Porter’s Night And Day, I Get A Kick Out Of You, Love For Sale, Just One Of Those Things; Jerome Kern’s All The Things You Are, The Way You Look Tonight, The Song Is You, Yesterdays; Harold Arlen’s When The Sun Comes Out, A Sleeping’ Bee, My Shining Hour, Over The Rainbow, Stormy Weather, Come Rain Or Come Shine ; Duke Ellington’s Don’t Get Around Much Anymore, A Train, Do Nothing Till You Hear From Me, Sophisticated Lady and many more …. We can mix it up with bossa novas – Girl From Ipanema, Corcovado, Dindi etc… , Blues – Going To Chicago, Evil Woman Blues, Everyday I Have The Blues , Alright , OK, You Win etc… Even a few funky R&B tunes from New Orleans , Sly Stone, Aretha Franklin , or James Brown. Duos consist of sax/vocals and guitar; or sax/vocals and piano. Trios would be sax/vox, guitar, and bass; sax/vox, piano, and bass; or sax/vox, organ, and drums. Quartets would be sax/vox, guitar, bass and drums or sax/vox, piano, bass, drums, or sax/vox, guitar, organ drums. A quintet would typically be sax/vox, trumpet, piano, bass and drums. Contact Juli for a consultation to help you make your choice.